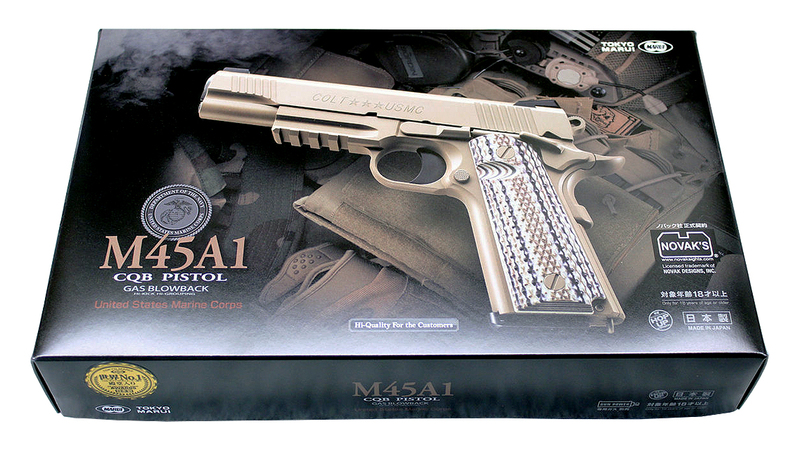 Tokyo Marui's take on the MEU 1911 successor, designated the M45A1, comes fantastically made (and with a hidden improvement). 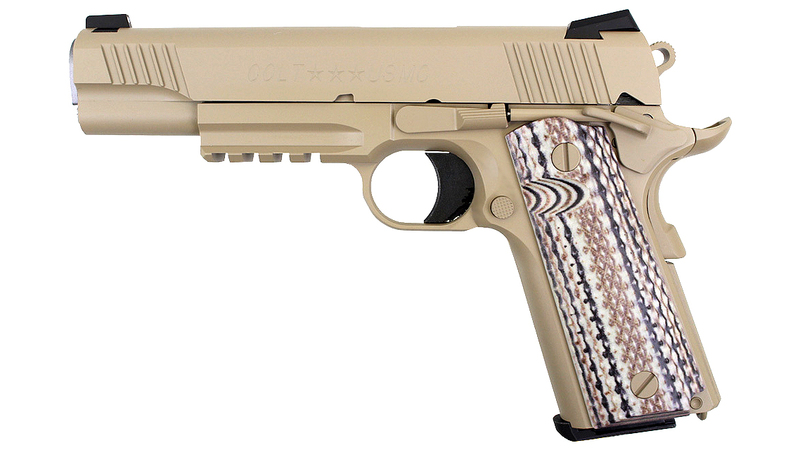 Changes to the original M45 MEUSOC are the desert tan color scheme, 3-dot sights (real steel would feature tritium night sights), 5 inch match barrel & a larger picatinny light rail (sits lower). - Desert Battle Colour : Colours matching the real colours used on the firearm that is used in late Middle East operations. - Parting Lines Finish：The parting lines resulting from moulding are carefully sanded by hand for a nice smooth finish. - Novak Officially Licensed Rear Sight：Replicating the widely used Novak tactical sight. 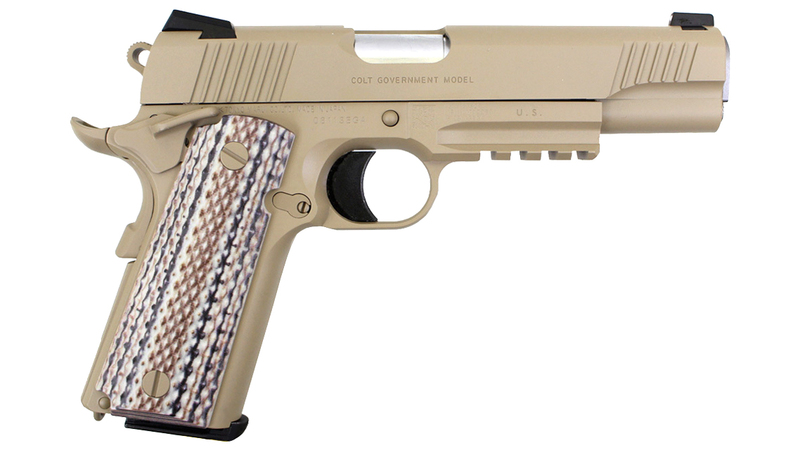 - G10 Type Grip：The very typical grip from the M45A1 is replicated using a special printing system. - Under Rail : The under rail is molded into the frame and provides a 20mm picatinny rail in order to install a very large number of accessories. 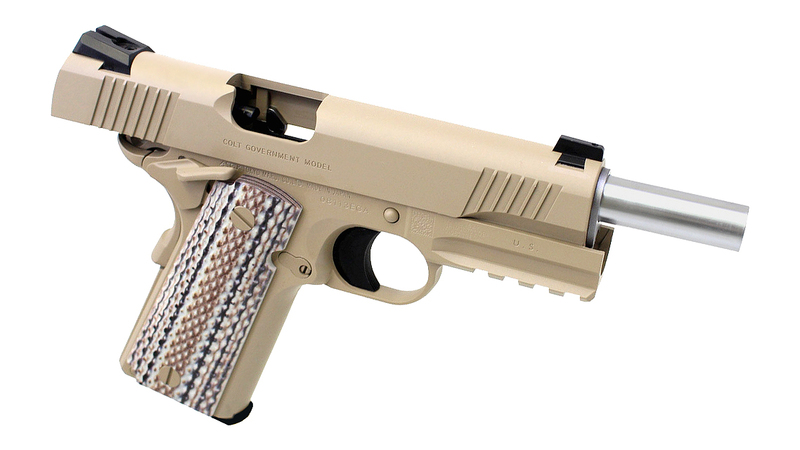 - Upgraded Internals & Mechanism：The blowback engine has been redesigned and provides a stronger recoil with the same amount of gas as the already existing Marui 1911 GBB. - The new short recoil system added to the M45A1 gives this new gun a very stable cycle. - Metal Notch Spacer：A metal piece inside the ABS slide will catch the slide stop when magazine empty. The ABS slide will not be wore off by a heavy use of the slide stop.